Find hotel near Mythe Barn - Wedding Venu .. This is one of the best wedding venues in Warwickshire. So, if you are looking for a perfect place for this reason, then you make this beautiful destination your choice. The refined, rustic and contemporary hall gives you the ideal atmosphere for the most special day in your life. You can choose both the indoor place which is furnished with oak and the serenely beautiful garden. All the food arrangements are made by the authorities starting from delicious breakfast to the supper. There is a special honeymoon suit to make your day extra special here. Use Atherstone trip planner to visit Mythe Barn - Wedding Venue In Warwickshire and many others to your visit. You can enjoy a comfortable stay in the city by booking the best hotels in Atherstone like Days Inn Corley - Nec (m6), Holiday Inn Express Tamworth and Grimscote Manor Hotel. Explore the best Atherstone vacation packages that will take to you important landmarks of the city! For getting in, check out how to reach Atherstone. Love this? Explore the entire list of places to visit in Atherstone before you plan your trip. Fancy a good night's sleep after a tiring day? Check out where to stay in Atherstone and book an accommodation of your choice. 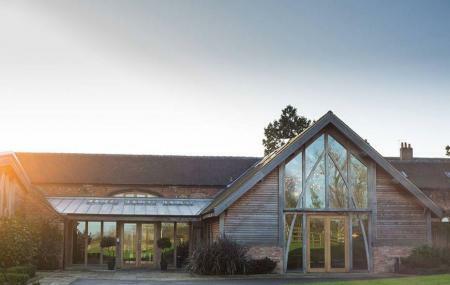 How popular is Mythe Barn - Wedding Venue In Warwickshire? People normally club together Gurdwara Dhan Dhan Baba Vadbhag Singh Ji Bedworth and Drakelow Park while planning their visit to Mythe Barn - Wedding Venue In Warwickshire. Amazing venue for wedding and the catering was awesome - lost a star for drinks prices! !